Additional trash carts are available for weekly service for an additional monthly fee. One bundle of branches or cardboard boxes (3 feet in length and 18 inches in diameter) is equal to one bag of your weekly limit. Cardboard boxes filled with trash are not acceptable. Please set all carts out at curbside by 6:00am. Better yet, how about the night before? Carts should be placed at curbside with the lid opening towards the street and side by side at least 3 feet apart. Clearance should be 3 feet in each direction away from parked cars or free standing objects. Personal Containers / Trash Bags: 35 lbs. To avoid having an overweight cart, or causing possible damage to the cart or truck, do not place rocks, concrete, brick or dirt in carts. All trash inside must fall out when the cart is serviced. Please DO NOT overfill carts or compact waste into the cart. To minimize excess trash blowing in your neighborhood, please place cart out for collection with the lid completely closed. If the cart is overweight, the driver will attempt to service it and notify the resident by leaving an Important Notice tag attached to the cart. If, however, we are unable to empty the cart, the cart will be tagged overweight and the resident will need to lighten the contents for the following week's service. Each resident is responsible for the cleaning and security of the trash and recycling carts. If carts are damaged or destroyed, other than by normal usage, please contact the Customer Service Center to place an order for replacement. As a courtesy to your neighbor, please promptly remove carts after service. Do not place the following hazardous waste in your cart: paint, oil, automotive batteries, tires, hot ashes, hazardous waste, E-waste, infectious waste and dead animals (weighing more than 10 lbs). If these materials are found in the cart, it will be tagged and not serviced. Do you know of anyone illegally disposing of trash? Take part in keeping our community clean by reporting any illegal activity. Call the Illegal Dumping Hotline at (888) 8DUMPING (838-6746) or Stay in touch and read the most recent Local Trash Talk newsletter for up to date information, programs, and services. Do your part and recycle for your community! 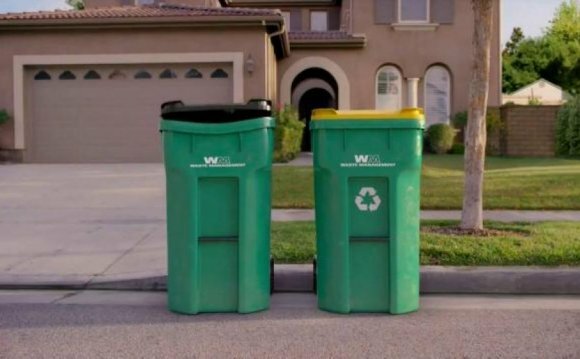 Waste Management hosts community recycling drop-off locations throughout the LA County unincorporated areas. Programs are FREE to use and many benefit local community organizations. Click here to view the flyer for more information. Call the Customer Service Center at least one day in advance, prior to your service day to arrange this special service. You will be able to place at your curb. The charge for bulky items is $15 per item. Acceptable Bulky Items Examples of bulky items are: furniture (e.g., mattress, box spring, desk), stove, washers, garage door openers and water heaters. PVC pipes, wood and metal must be bundled (3' in length and 18" in diameter) and not heavier than 35 lbs. Bulky items cannot exceed 300 lbs each. Non-Acceptable Bulky Items Household Hazardous Waste (HHW) (e.g., oil, paint, tires and batteries), TVs, microwaves, monitors, computers, car motors and parts, spas, pianos, camper shells, and cast iron bathtubs. Going on Vacation? Please call in advance to place your account on vacation hold. To be eligible, a minimum of three consecutive months is required. If notification is not made in advance, credit will not be issued. It is the customer's responsibility to notify customer service upon return. Quartz Hill Area Only: Clean Christmas trees without stands and flocking will be picked up at curbside the first two weeks in January. Please contact Customer Service for exact dates. Acton, Agua Dulce, Lake Hughes, Lake Elizabeth, Leona Valley, Lake Los Angeles, Littlerock and Pearblossom areas, please contact your local town council for recycling locations. Quarterly invoices are generated every three months. Payment is due within 10 days of the date of the invoice. Pay by check, Visa, Mastercard, American Express or cash. To ensure proper credit to your account, please indicate your Waste Management account number on your check and enclose the remittance slip with your payment. Missing remittance slips may result in a delay of payment application to your account. If service is interrupted for non-payment, the past due balance and two month's service is required to be paid in advance to re-establish service. All returned checks are subject to a $25.00 service fee. Waste Management offers a 5% discount on accounts paid annually. Requirements: a) Applicant is 62 years of age or older, b) service must be in applicants name, and c) copy of driver's license and utility bill required. Free Bulky Item Drop-off - Residents can drop-off one bulky item (e.g., sofa, table, mattress, etc) per year, free of charge. Must provide proof of residence. Free Waste Tire Drop-off - Residents can drop-off up to 4 waste tires per year, free of charge. Must provide proof of residence.